Win Free APAHM Concert Tickets from TaiwaneseAmerican.org! Posted on Saturday, May 29th, 2010 at 12:00 pm. In light of Asian Pacific American Heritage Month, we’re excited to bring you the opportunity to win free tickets to the APAHM Concert featuring Taiwanese American artists Van Ness Wu and Evonne Hsu, as well as Taiwan-based pop singer JJ Lin and Asian American DJ, Mike Relm. APAHM Concerts will be taking place in Seattle, San Francisco, Los Angeles, New York, and Washington DC all this month of May! Here’s how you can win a TaiwaneseAmerican.org sponsored free ticket to any one of these concerts! 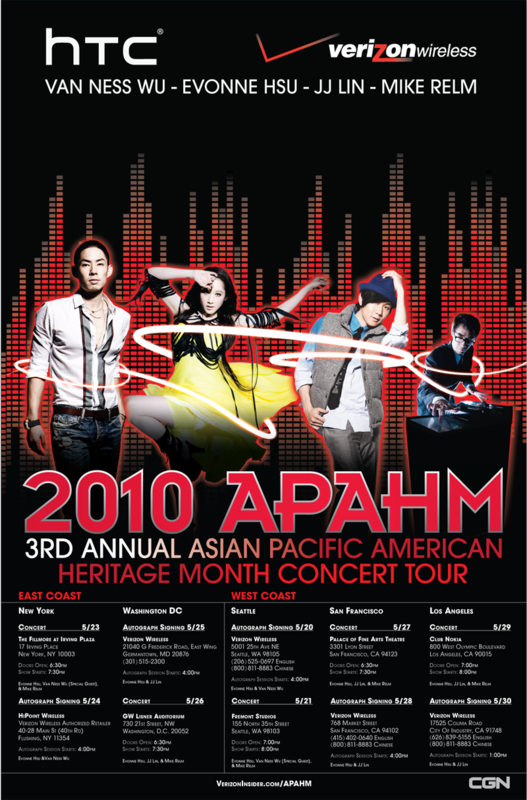 – Why is APA Heritage Month important AND why TaiwaneseAmerican.org should sponsor me a ticket to the concert? 3) Send us an e-mail at [email protected] with your name, address, which concert you want to go to, and a link to your entry! By noon on the day before each concert, we’ll select up to 5 winners based on 1) best answer OR 2) most likes (thumbs up) – so think hard and tell all your friends! We’re looking forward to the video responses!